It started life as another one of ThinkGeek's impressive April Fool's Day prank products, but like the Tauntaun sleeping bag before it, there was enough demand from the site's fans to make the Technomancer Digital Wizard Hoodie a reality. If you're a cosplayer who's ever dreamed of magical powers, you better go get your credit card. Using a set of built-in accelerometers and strips of colored, low-heat LEDs, the sleeves and hood of this cosplayer's dream outfit light-up in response to specific movements. 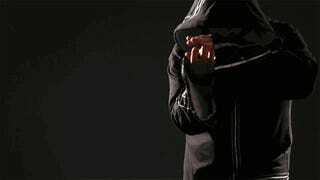 The hoodie lets you perform nine different pre-programmed spells in all, including shooting fireballs, raising the dead, and blasting lightning bolts.